St. Paul, Minn. – Macalester History Professor Ernesto Capello has been awarded a National Endowment for the Humanities (NEH) fellowship to research the impact of a French scientific mission to Ecuador for a future book he is writing. Capello received a $50,400 award from the Fellowships for College Teachers and Independent Scholars program at the NEH for his project The Economic, Scientific, and Artistic Impact of the 1901-1906 French Geodesic Mission to Ecuador. Only seven percent of the fellowship proposals submitted to the NEH are selected for funding. His 12-month grant period runs through December 31, 2013. Capello has already begun research in Ecuador and France for his book that focuses on the social, artistic, and economic ramifications of the French Geodesic mission to Ecuador over 100 years ago. Their goal: to verify Isaac Newton’s theory of gravity. La Condamine’s melodramatic travelogue, filled with exotic portraits of tropical nature and its “barbaric” inhabitants, spurred a global fascination with the “land of the equator,” and inspired journeys by European and American intellectuals, including famed Prussian naturalist Alexander von Humboldt and Hudson River school painter Frederic Edwin Church. Capello’s new book considers how a second, commemorative French mission to Ecuador conducted a new series of geodesic measurements while also initiating a modern memorial culture featuring ceremonial obelisks. 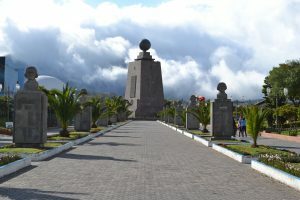 These celebrated Franco-Ecuadorian contributions to geodesic science and also opened up important venues for equatorial tourism, such as the Mitad del Mundo monument north of Quito. In his first book, City at the Center of the World: Space, History, and Modernity in Quito, Capello analyzed the formation of modernity, memory, and myth through the eyes of diverse populations in Quito, Ecuador’s capital city.